Oliver Sacks is the Carl Sagan or Stephen Jay Gould of his field; his books are true classics of medical writing, of the breadth of human mentality, and of the inner lives of the disabled. In this book, he presents seven case studies of people whose "abnormalities" of brain function offer new insights into conceptions of human personality and consciousness. The works of neurologist Oliver Sacks have a special place in the swarm of mind-brain studies. He has done as much as anyone to make nonspecialists aware of how much diversity gets lumped under the heading of "the human mind." 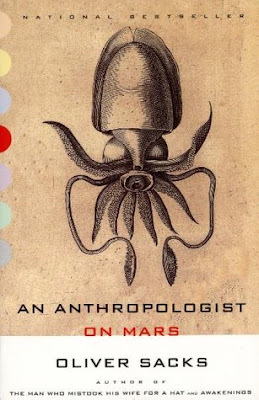 The stories in An Anthropologist on Mars are medical case reports not unlike the classic tales of Berton Roueché in The Medical Detectives. Sacks's stories are of "differently brained" people, and they have the intrinsic human interest that spurred his book Awakenings to be re-created as a Robin Williams movie. The title story in Anthropologist is that of autistic Temple Grandin, whose own book Thinking in Pictures gives her version of how she feels--as unlike other humans as a cow or a Martian. The other minds Sacks describes are equally remarkable: a surgeon with Tourette's syndrome, a painter who loses color vision, a blind man given the ambiguous gift of sight, artists with memories that overwhelm "real life," the autistic artist Stephen Wiltshire, and a man with memory damage for whom it is always 1968.